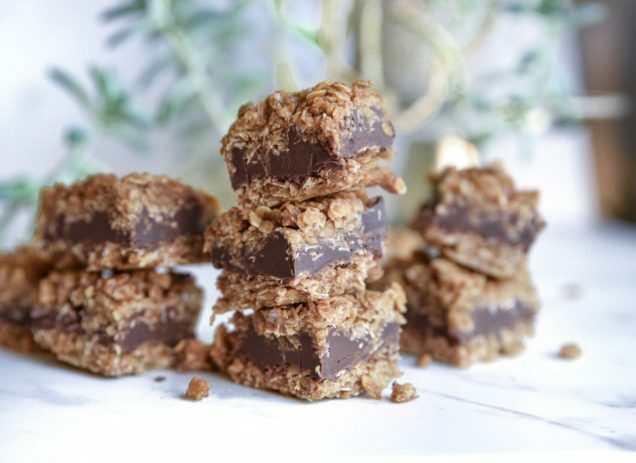 No Bake Chocolate Peanut Butter Oat Fudge Bars! These delicious treats take next to no time to make and make for the perfect sweet treat or dessert idea! I literally ate the whole lot within 2 days.. might have to double the batch if you have no will power like myself..
Line an 8×8 square pan with baking paper. Set aside. Melt butter in a saucepan over medium heat. Stir in coconut sugar and vanilla. Mix in oats and cook over low heat for 2-3 minutes, or until ingredients are well blended. Press half the mixture into the bottom of pre prepared pan, reserving the other half for the topping. Meanwhile, melt chocolate and peanut butter in a small saucepan over low heat, stirring frequently until smooth and lump free. Pour over the crust in the pan and spread evenly. Crumble there remaining oat mixture over the chocolate layer, pressing in gently. Cover, and refrigerate for 3-4 hours or overnight.